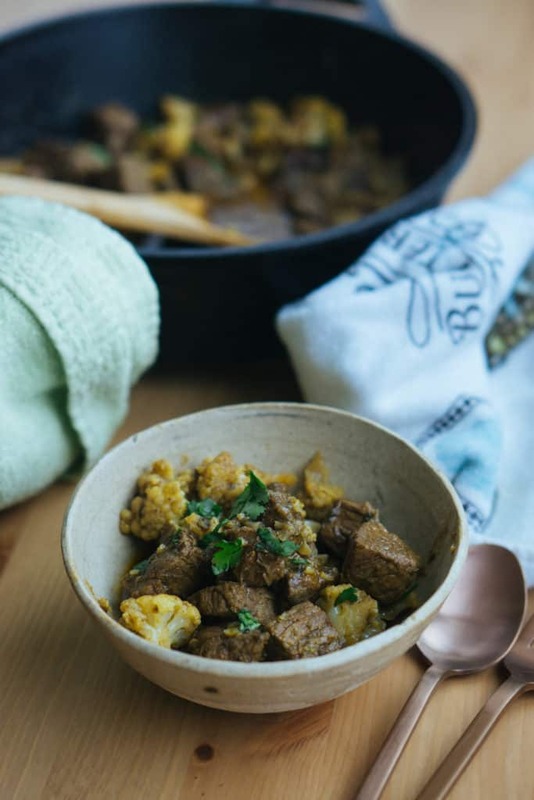 We often find one-pot meals are the best kind to make and that includes this Keto Curried Beef recipe! It's rich and creamy, hearty, and overall a well balanced meal from the meat to the veggies. It reminds us of Indian take-out without the added sugars or the worry about how many carbs are in each serving. We can enjoy and indulge stress free while hitting our macros! The Best Curry Recipes are the Easiest Ones! The hardest part about this curry recipe is allowing it to simmer for 20 minutes, so the meat can cook through and become tender before you can dig in. Aside from that, this recipe is easy from start to finish. Most curry recipes, including our butter chicken recipe, usually call for tossing everything into one pot, stirring every so often and waiting until the magic happens over the course of 15-30 minutes. This recipe is no different and can be adjusted to your liking. As you can see from the pictures we added in some cauliflower toward the end to make this meal more complete, but you can also serve it with our low carb naan or change up the veggie altogether! We love having at least three to four cans of coconut milk in our house at all times because we love how versatile it is. You may not be able to tell just from looking at the pictures, but this recipe contains a can of coconut milk. It's thick, rich and adds a subtle, delicious flavor to anything you make with it. It's also great in desserts like our low carb coconut cream pie and breakfasts like our keto oatmeal! You can use it to make icing for cakes and cookies and also just go off the rails a bit and improvise a Coconut Curry recipe! It's definitely one of our favorite ingredients to experiment with. If you're a curry fan or love hearty, comforting meals, this recipe was made just for you. It's a quick, one-pot, 30-minute meal, so not only is it a quick clean up, but you don't have to wait a long time for it to be ready. You can serve it up however you like and with whatever veggies you have left in the fridge because the curry sauce and spices will make anything taste good! 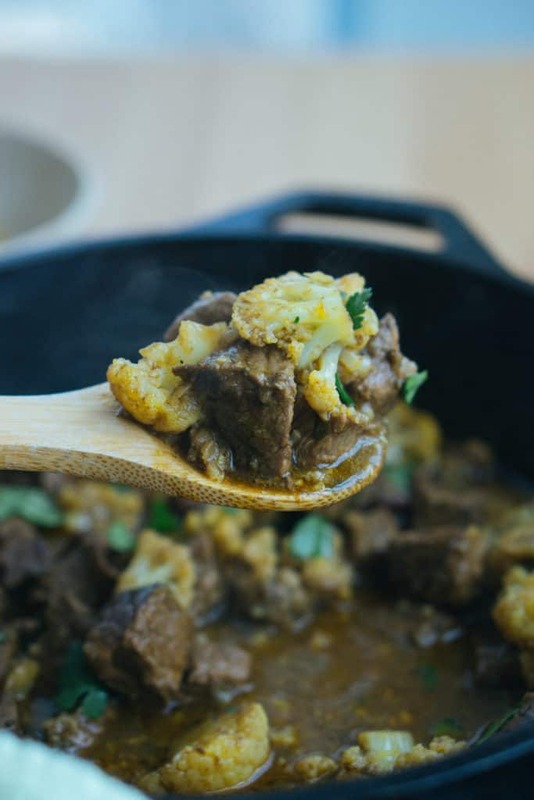 Make this Keto Curried Beef for your family and watch them be amazed at how good low-carb food can taste! 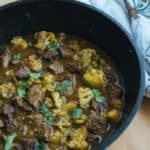 Recipe can be quickly added to MyFitnessPal - Search "KetoConnect - Keto Curried Beef"
Place the can of coconut milk int he freezer until ready to use in the recipe. Heat a large pan or dutch oven over medium-high heat and add 1/2 tbsp coconut oil. Once hot, add in the stew meat pieces and brown on all side (does not need to be cooked all the way through). Remove from the pan/pot and set aside in a bowl. Add the 1/2 tbsp coconut oil to hot pan and turn the heat to medium. Scrape up the bottom using a spatula. Add in the diced onion, and allow to cook for 1-2 minutes until translucent. Add in the garlic, curry powder, cumin, salt and chili powder. Combine using the spatula and cook for 1-2 minutes until spices are fragrant. Add the stew meat back in and stir to combine. Remove the coconut milk from the freezer (should have been at least 10 minutes) and open can. The milk should have hardened so that you can remove it separately from the coconut water at the bottom. Add the hardened coconut milk to the beef mixture and allow to melt down. Add the water and stir until thoroughly combined. Place a lid on the pan/pot and allow to simmer for 20 minutes. If you are adding in the cauliflower, add it after ten minutes have passed and then replace with the lid and allow to cook remaining time. Remove the lid and either serve immediately (meat will be fully cooked) or allow to reduce for a thicker curry sauce for an additional 10 minutes. Serve over cauliflower rice or with our low carb naan and enjoy! Note: Store in sealed container in the fridge up to 1 week or freeze up to 1 month.